I recently attended to the annual Free and Open Source Software Development european meeting, FOSDEM, at brussels with my colleague, Miguel Tellería. It was a very interesting experience for me and I managed to have a glance about how the state of art is on the Free software movement right now (I mean, what's moving on at the moment!!). There is VERY GOOD website for the meeting where you can see the videos of the conferences, pictures, slides, etc.. very useful if you wanted to go but you couldn't. The conferences I enjoyed the most where the ones at the Embedded Developers room. 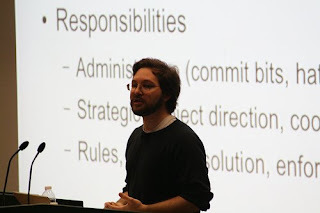 The talk about the FreeBSD project management (above) was also quite interesting. About Brussels I walked all over the city and I think it's a nice place, a bit dull sometimes (but my opinion has no credit because I were there for a few days only). We spent the night in a Miguel's friend's house which was in a Turkish district. I tasted the Turkish youghurt and some cakes and the were very tasty! 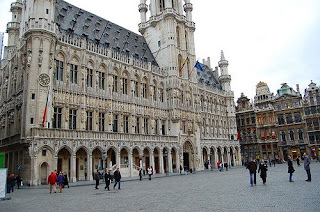 The main place in Brussels is the square at the Hotel de Ville (city hall in French). In a restaurant near Fosdem I had a very well cooked lasagna (very typical in Brussels i think) and Beans with chile (which Miguel told me are more from Texas than from Mexico).